Every year, one of the first signs of spring is the parking lot adjacent to the Civic Centre and Drill Hall jammed with vehicles. March 12th, 2014 was ‘changing of the seasons’ day as kids and parents were trudging in and out of the Civic Centre with equipment bags and hockey sticks in hand, while anticipating the end of the long, cold winter season. Others were going into the Drill hall with Visa or cheque book in hand to greet spring and summer by signing their youngsters or themselves up for a vast array of recreational and educational activities. Inside, dozens of committed volunteers filled the Drill Hall advertising their programs and services and taking registrations for the spring and summer programs. The 60 page Activity Guide, Wetaskiwin 2014 Spring/Summer Programs is available throughout the community and provides detailed information about courses and programs, the instructors, cost, dates and locations. 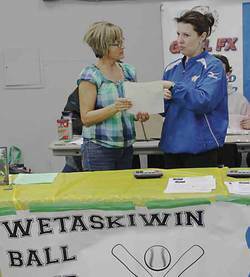 Residents of Wetaskiwin and region look forward to the Parade of Programs every spring and fall. The evening event is hosted by the Community Learning Council and the City of Wetaskiwin to provide a one-stop-shopping opportunity for the entire family to see what new programs and services are being offered, and to register for clubs, programs and activities. Instructors and other people responsible for the activities were available to answer any questions and describe their programs and services in more detail. There is lots to do in Wetaskiwin and people of all ages were checking it out. The wide variety of community groups represented arts and culture, museums, fitness, pre-school programs, youth programs, adult education, seniors programs and numerous other community clubs and events.